Last December I posted on my top 3 books published in 2010. This year, moving home has meant I've handled all of my books several times over - sorting (having an indulgent read), giving away, packing (having an indulgent read), unpacking (reading). It's been a good opportunity to remind myself what I have, what I don't need and what I absolutely do. So, I was tempted to do a December review of older books this year, but for consistency here are my top picks of 2011 food publications. I will indulge myself with more reviews of older books in 2012. BOCCA Cookbook comes out of chef Jacob Kenedy's travels experiencing the food of Italy. In this book he makes clear the impossibility of pinning down "Italian" cuisine. In Italy local food is of huge importance and pride and each region has a rich culinary tradition. Kenedy, who cut his teeth at restaurants Moro in London and Boulevard in San Francisco, here gives us his take on the dishes he devoured in Italy and his own dishes which they infuenced. Authenticity is of less concern to him than honesty as he found "...each city, hamlet and household has its own version of a dish ..." and "...it would be a hard task to find two ... who could agree on how to make (it) ..". 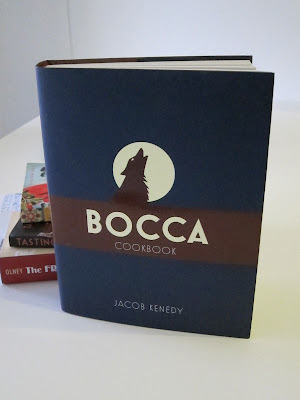 Having whiled away many an hour at Boccca di Lupo (Mouth of the Wolf) which he opened in London's Soho after the inspiration of his travels, all I can say is Kenedy's food makes me very happy. So, the recipes in this book, authentic or not, are deliciously familiar to me. The ingredients lists are admirably short, which is, I think, very Italian and one of the reasons I like Italian food so much. Simple appetisers such as Fried Olives stuffed with Pork and Veal from Le Marche region and Fried Whole Artichokes from Lazio are here along with a beautiful original salad recipe of Shaved Radish and Celeriac with Pomegranate, Pecorino and Truffle Oil. From Liguria comes Nettle and Chard Pansoti with Walnut Sauce, from Lazio Potato Gnocchi with Sausage Ragu, a Samphire and Clam Risotto from Emilia-Romagna, Sardines 'Beccafico' from Sicily and Hare in Salmi from Lombardy. There are puddings too but Kenedy's thing is gelato, and he knows his subject well. Particularly fine is his Milk-Free Espresso Gelato. So nice to see credit given to one of my my favourite cooks, David Cook, in the acknowledgements section. A highly regarded chef and writer, Hopkinson left the kitchens of London's Bibendum Restaurant in 1995 to concentrate on writing. 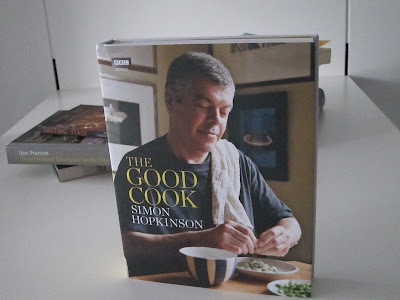 Simon Hopkinson's cooking is timeless and his writing full of good sense. This book calls for no fancy ingredients, there is no gimickry and no striving for novelty. For him, provenance of ingredients are of less importance than the care taken in the cooking. As anyone familiar with my blog will appreciate, this is a view I can't share. For me they have equal import but it does not change my regard for this book. The 100 recipes are divided into chapters in Hopkinson's distinctive straightforward fashion. Basically a list of things he likes, such as Anchovy & Aubergine, to which he devotes 20 pages with recipes such as anchovy & onion tarts; Cheese & Wine, including the deeply comforting My mother's Lancashire cheese & onion pie, a perfect Coq au Vin and Poached Eggs in Coq au Vin gravy, in case you have any sauce left over - which brings to my mind the classic French dish of Oeufs en Meurette. Desserts and Puddings are mainly classics including what may be the definitive recipes for the very English dishes of Rice Pudding and Sticky Toffee Pudding. Just like Hopkinson's first book, Roast Chicken and Other Stories, I know I will use this book again and again. From the owners and Basque-born chef of one of the best tapas bars in London, this is a much anticipated book. The Hart brothers are greatly admired on the London restaurant scene, having three restaurants of which Barrafina in Soho is, I think, the best. Heavily influenced by Cal Pep in Barcelona's El Born district, Barrafina's authenticity is obvious from the moment you take a seat at the bar and watch the hugely talented Nieves orchestrating her team. The photographs in this book are beautiful, almost too beautiful. It could, and will, decorate a number of coffee tables. A quick flick through could seduce you into thinking the recipes are short and, therefore, easy, and some are. A deeper study will reveal the preparation work needed to produce others. 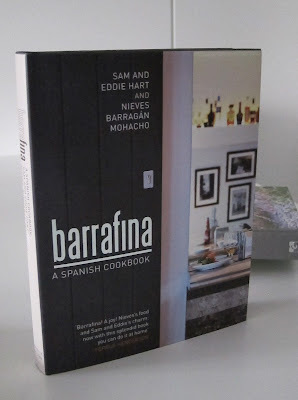 If you really love to cook Spanish food, as I do, you'll love this book, though you may find yourself having to substitute some recipe ingredients. Delicious easy recipes include Razor clams with broad beans and jamon, Mussels with sherry vinaigrette, Calves liver with celeriac puree and caramelised onions, Beetroot salad with Picos cheese, Pisto and duck egg, Braised leg of milk-fed lamb with Manazanilla, Loin of venison with red cabbage, pinenuts and sultanas and Crema Catalana. Finding I have Barrafina's recipe for Arrocina beans with chorizo, morcilla and pork belly in my hot little hands is enough to overcome any concerns about glossy presentation.